For my birthday Mrs. Trader bought me a personalized Oak Barrel from American Oak Barrel. At first I was only going to use it as a part of the eclectic decor that I continually add to but then it seemed like a waste to just have an empty barrel hanging there… empty… when I could be hanging there with rum inside. March 17, 2018 – Day 5: So the barrel started out pretty “leaky” however after two days of soaking it sealed up nicely. Just in case I let it soak for an additional 3 days to make sure it was nice and solid. April 8, 2018 – Day 27: The rum takes to the skies!!! Way back when I was first starting decorating Trader Jay’s I was on a long hunt for pulleys or sailing blocks. I felt like we definitely needed them for the decor. I kept coming up short but then Mrs. Trader stumbled upon some while out and about. She bought three (not knowing which I’d like/want). Well, while they were good they just sat unused for over a year. Since receiving the Barrel I had it in the back of my head that I wanted to hang it from the ceiling using the pulleys. So, Sunday I finally made it happen. While there is some nervousness over it all, it seems to be anchored well and secure. So now I have an Aging Rum Barrel hanging from the ceiling… and that’s the real dream, right??? My Rum and Tiki journey has reached a year and what a ride! I’ve learned to much but still have a long way to go! As I sit on the Beach down in Key Biscayne (island off Miami) I sip a frozen mojito (highly recommended) and reflect on my learnings so far. I figure the gateway to the Caribbean is as good a place as ever to summarize my lessons thus far. If the drink menu says “Mai Tai = spiced rum and fruit juices” then that is a hard pass! I can accept a slight variation from Trader Vic’s Original Recipe but it better have fresh juice and aged, quality rum. There is no substitute for fresh squeezed lime juice (or my special Frozen squeezed juice). Finding a quality rum at the basic bar is near impossible. Main stream bars haven’t caught on… most just carry Bacardi, Captain Morgan and then they think they are fancy if they have Meyers. I’ve tried a decent number of rums over the past year but still think Appleton Estate Reserve is my favorite multi-use mixing rum. It is the go to for my Mai Tai and many other drinks. For sipping, still keeping Plantation 20th anniversary on the top of the shelf (though I won’t lie that Zacapa is working its way up). If you are lucky enough to find a bartender who knows rums then talk as much as you can to them! They will share what they like and will enjoy the conversation enough, usually, to let you sample. Overproof rum doesn’t have to taste like rubbing alcohol… get some Plantation OFTD! It is a powerful ally (in the right quantities). There is never enough self space in an at home-Tiki-Bar-in-progress. Always buy the Tiki mug that comes with the drink, you’ll regret it if you don’t. Take your time and measure your drinks… you wouldn’t make a soufflé by just eyeballing it, don’t compromise on a perfectly crafted cocktail. 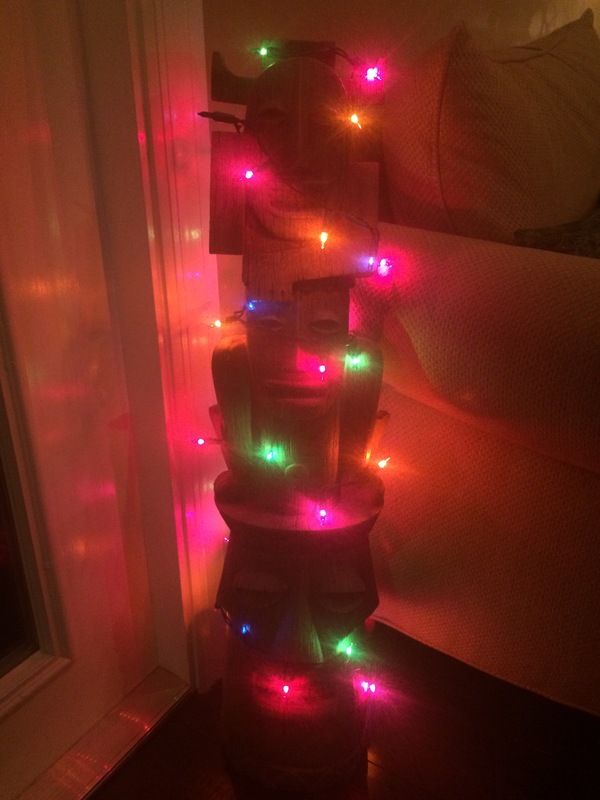 Your tiki bar will never be finished… both decorating and stocking with rum/liquor/mixers. The Tiki Community takes care of their own! Thank you to Trader Vic’s, Florida Mermaid Rum, the staff at the Marriott Denver South and Diplomatico Rum for their support. So there ya go, some of the lessons in Trader Jay’s first year! Here’s to many more Tiki-rific years to come! So you’ve taken the time to read about my private Tiki Bar… and maybe you’ve even taken that next step to experience one of the amazing Tiki Bars I’ve mentioned or reviewed but how will everyone know that you really went? The TIKI MUG, of course! No one knows exactly what the first tiki mug was but it is estimated it dates as far back as the late 50’s. 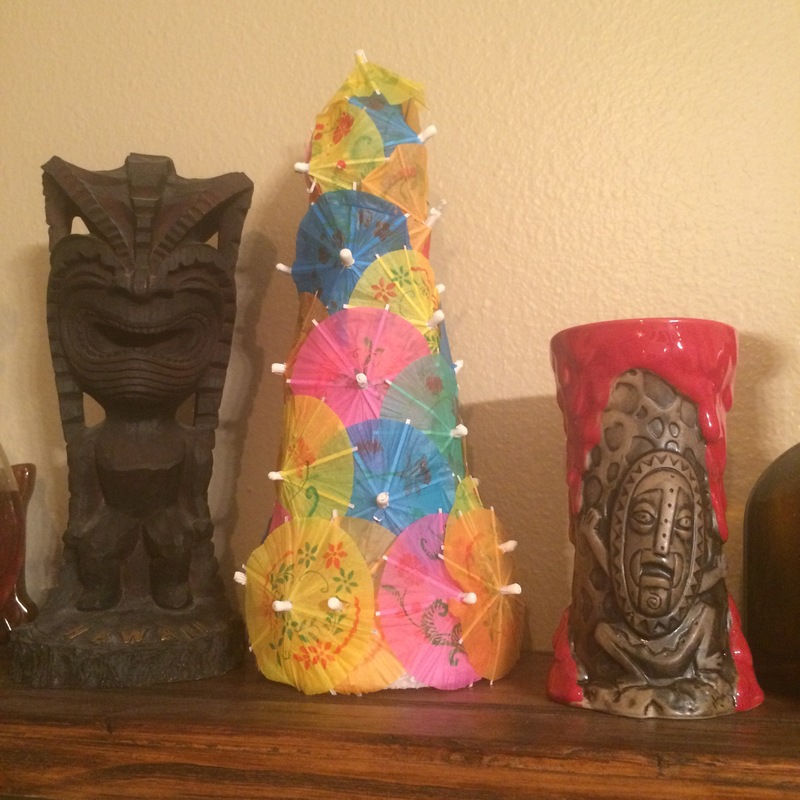 Since then collecting Tiki Mugs has been a pastime of many a Tiki Fan. Tiki mugs are large ceramic cocktail mugs which originated in tiki bars and tropical themed restaurants. The term “Tiki mugs” is a generic, blanket term for sculptural drinkware that depict Polynesian, mock-Polynesian, or tropical themes. Tiki mugs are not commonly seen outside tiki bars and restaurants, but are also a kitsch collectors item. My first Tiki Mug was actually a gift from my lifelong friend, Andy. Following our first trip to the famed Mai Kai he bought me a pair of the famed Barrel O’ Rum barrels. They probably are closing in on 15 years old by now and still an important part of my Tiki Mug collection. Following my barrels, the Tiki Mug collection grew very little until my first trip to the magical Trader Sam’s Grog Grotto. 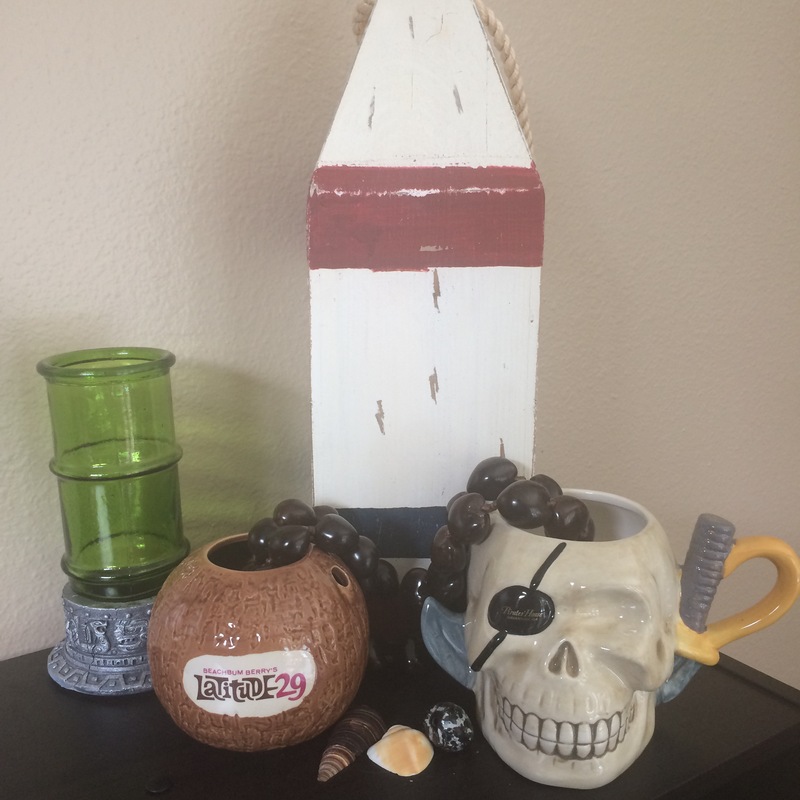 This was the point in which I decided to build my Tiki Bar (read about it here) and I knew the mugs would be an important part of this new journey. After only two visits to Trader Sam’s (and thanks to the generosity of two more lifelong friends, Rick and Goat) I had all the Grog Grotto Tiki Mugs. The collection was well on its way! Next came trips to other tiki establishments, including Trader Sam’s Enchanted Tiki Bar in Anaheim, Smuggler’s Cove in San Francisco, Three Dots and a Dash in Chicago and Latitude 29 in New Orleans. And, to prove I went, drank and enjoyed, I made sure that at least one mug came back to Trader Jay’s with me. 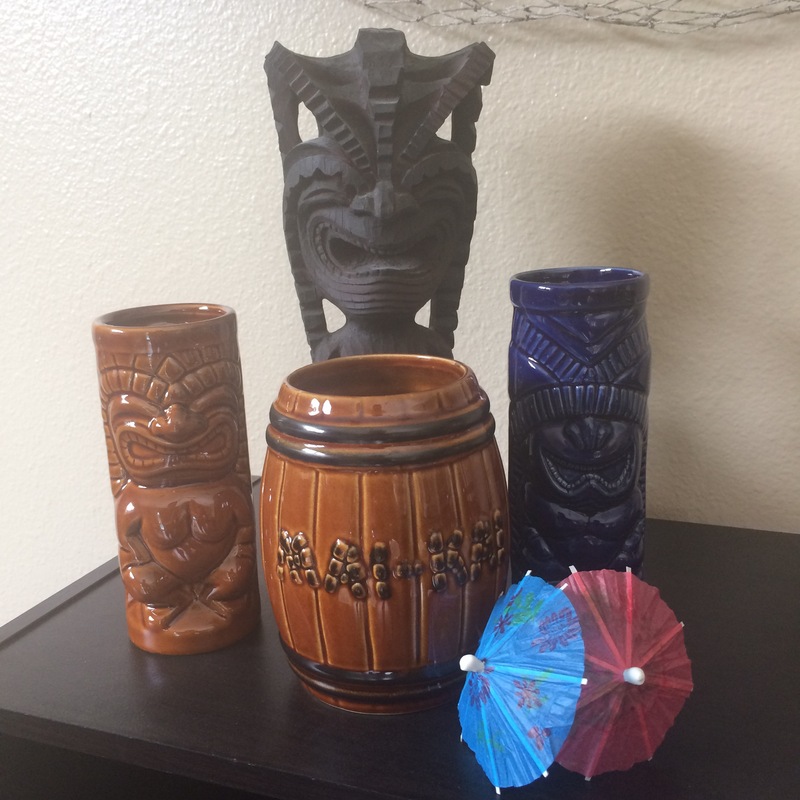 Another thing that I’m finding about becoming a known “Trader” to friends is that I’ve also been fortunate to be gifted Tiki Mugs and tiki barware along the way. Mugs from Smuggler’s Cove were gifts and there is a great story surrounding one of my mugs from Three Dots and a Dash. 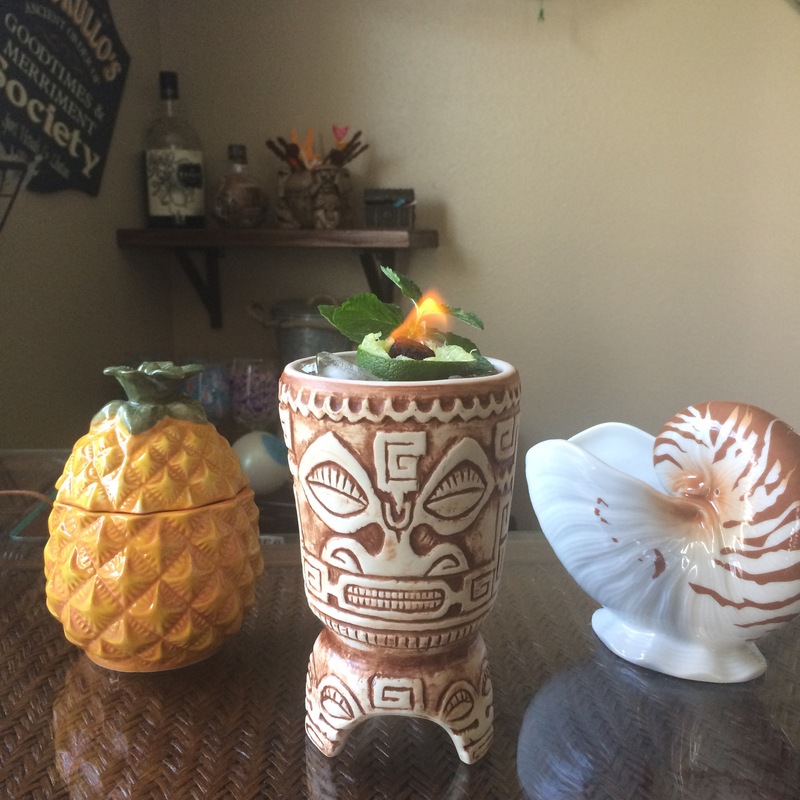 Also, the friend who convinced me to start this blog was kind enough to gift two tiki glasses from Lost Lake in Chicago (a bar I have yet to experience). Other big additions to my Tiki Mug collection are not from a Tiki Bar at all. 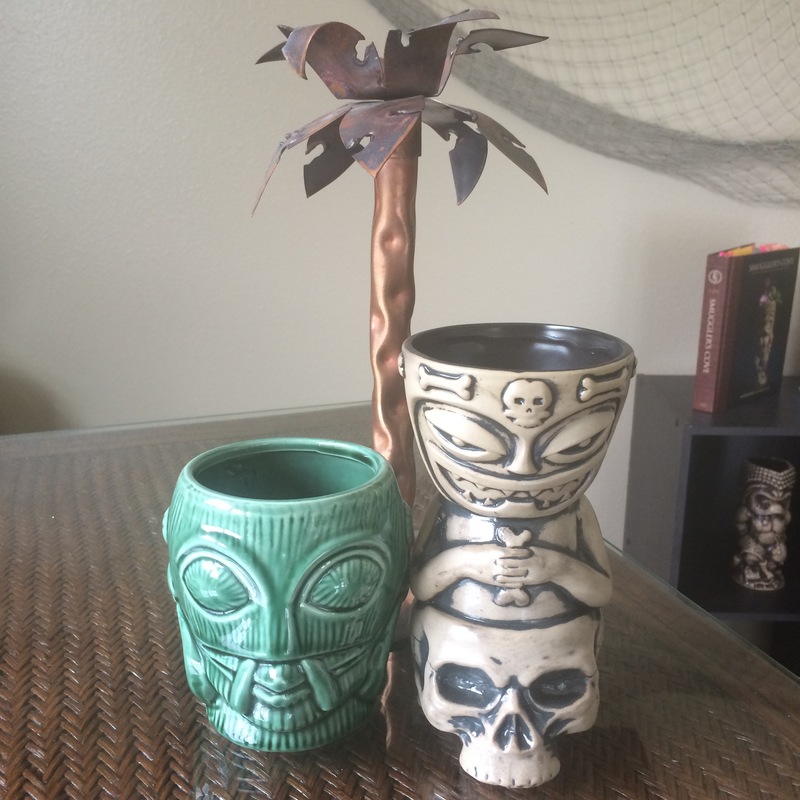 Some might say that they aren’t TRUE Tiki Mugs but with how awesome and unique they are I don’t particularly care. They are the first release of Geeki Tikis by Beeline Creative (sold on ThinkGeek). 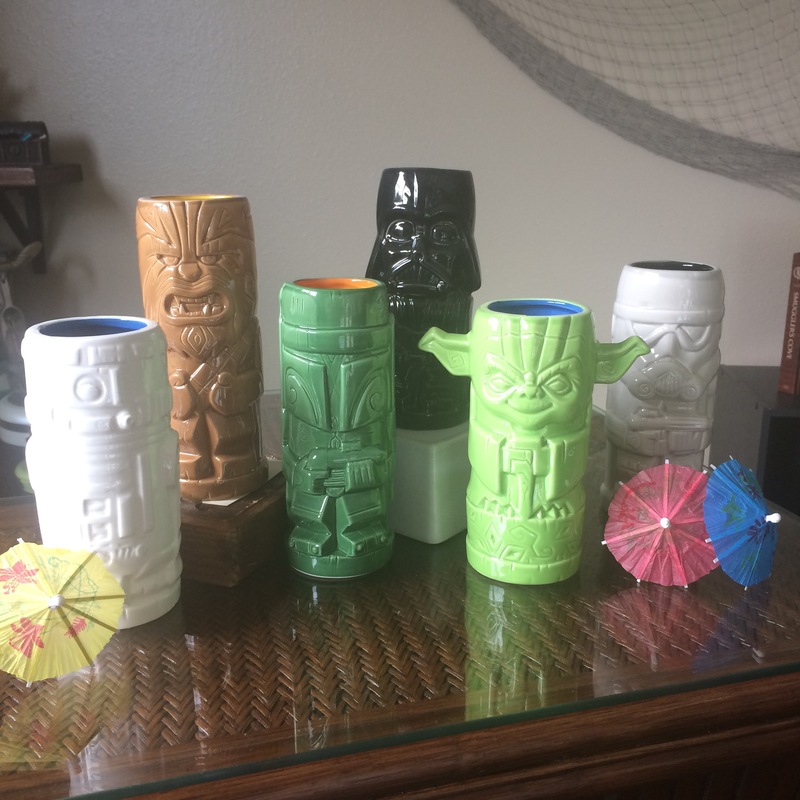 Being such a HUGE Star Wars fan, these Tiki Mugs are the perfect way to bring a little modern pop culture into Trader Jay’s (plus the kids love using them). 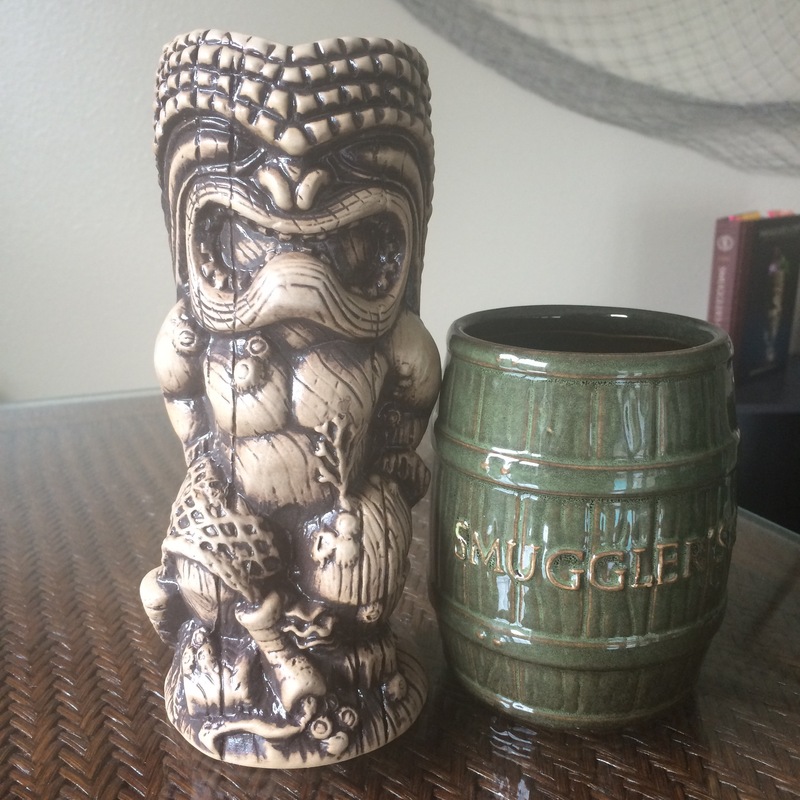 Finally, the most recent addition to my Tiki Mug collection (and chief reason for this blog topic)… Tiki Mugs directly from the home of the “Creator”, Trader Vic’s. This is the Tiki Bar at the VERY TOP of my “must visit” list, however the wonderful and generous staff at Trader Vic’s was kind enough to provide Trader Jay’s with three of their iconic Tiki Mugs. I plan to one day visit and order a drink housed in each mug (as well as an Original Mai Tai, of course). 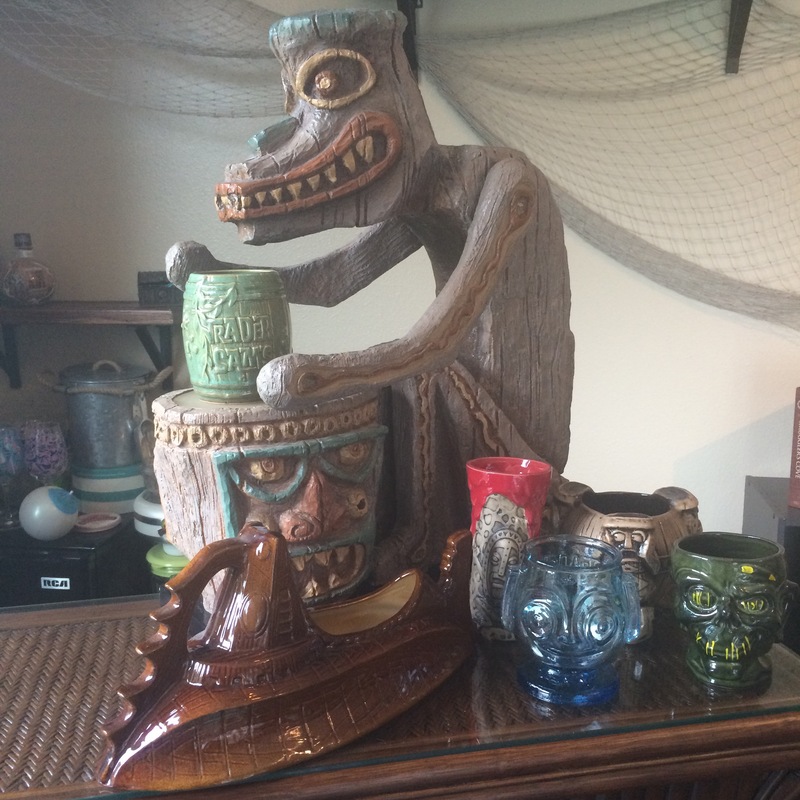 So there is my Tiki Mug collection story. I’m happy with how it has grown and plan to continue to grow it. If you want to help me add to it, I’ll always allow that… The Trader isn’t picky. And if you are in the San Fran area or Atlanta, be sure to visit my friends at Trader Vic’s! 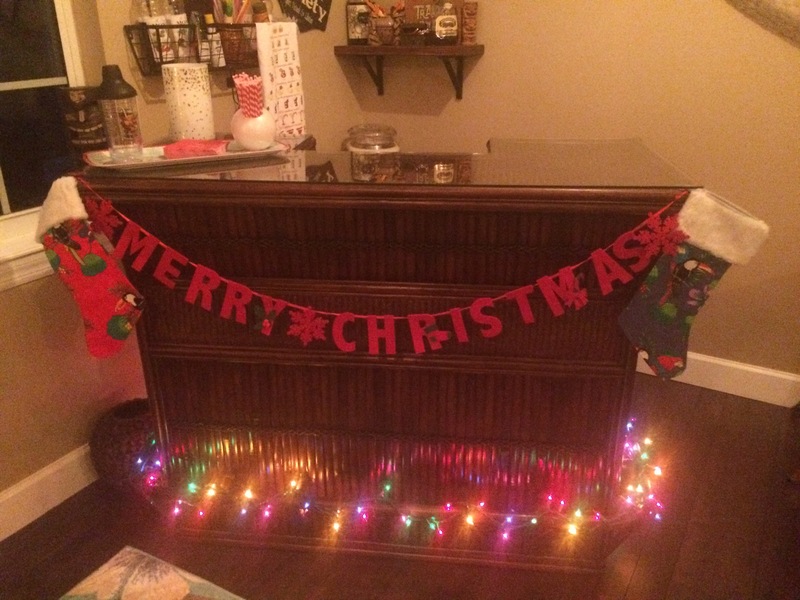 1) You go all out right after Thanksgiving to get your Christmas/Pick-Your-Other-Holiday decor up as quickly as possible. And 2) You run short on time to everything done you want. Life at Trader Jay’s is no different. Extra time to blog is very short but, fear not, the bar still gets a holiday overlay. The bar is decked in plenty of Kalikimaka fun! Not sure if I’ll get another post out before the holidays. If not, I wish you and your families Mele Kalikimaka!